MesDiscussion is a French software used by major web sites of the french Internet. MesDiscussions respects W3c norms, can support a really heavy load and is really powerful. You'll find only one bad point with this tool: its license, but fortunately, the official website provides a dedicated hosting solution. This is particularly useful for communities or companies which are looking for a powerful and a easy-to-manage forum software. MesDiscussions also provides the classical SEO module, helping your website to be crawled by search engines and, indirectly, helping the increase of its pagerank. MesDiscussions is recommended for Huge Community. We do not have many details about MesDiscussions.net technologies, but we know that it uses the famous LAMP solution (Linux, Apache, MySQL, PHP). The header, footer,... can be configured depending of the current forum of the user, that able administrator to do what they want with their forum. Of course, you can add PHP code in these parts, to display dynamic information. Some details about MesDiscussions features regarding members. 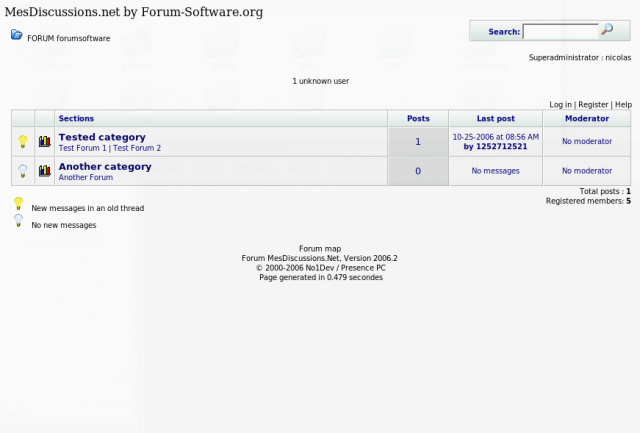 Convert an existing forum to MesDiscussions. The maximum score on Installation has been given because this part is done by the company working on MesDiscussions.net forum. So, this is something that you should not take care anymore. About userbase integration, No One Development provides modules to their clients to plug MesDiscussions.net to their existing databases. This is for example the case for France Television company (FTVi). Please note that their are some non-official plugins, like MD Enhance, even if MesDiscussions do not provide a specific architecture to integrate them. Does MesDiscussions correctly follow (X)HTML and CSS norms? In one word, MesDiscussions.net is a really powerful software. It allows companies and communities without any computer science knowledges having a forum software that will help them develop their business. Hardware.fr and France 2 are example of big forums that use MesDiscussions.net, and are evidences to prove that this is a really good and adaptive software. The only bad point is that currently, it seems that MesDiscussions.net has only convinced french company to use it, and we do not have example of international ones that use it. This is the same company that provides support, hosting and develops the software, so you can be sure that any problems will be quickly fixed. Compare MesDiscussions vs PhpBB 3 vs Simple Machines 2. Ask your questions to the MesDiscussions Community Forum. Get Users Reviews about MesDiscussions and Share your experience. Je pense que dans la description du forum, tu peux changer / mettre à jour différents trucs. D'abord, la version indiquée n'est pas celle installée sur la démo. Current version : 2006.2 (July, 2006). C'est la 2007.1 qui est installée actuellement. Ensuite, quand tu écris "Download Link : Download this forum software here : MesDiscussions" je ne pense pas que "Download" soit bien approprié, puisque le site ne sert qu'à "commander" le forum. To purchase/buy être plus proche de la rélité je crois (à toi de voir). Dans la partie "Post Form" tu indiques seulement "Rich Text Editor" alors que MesDiscussions dispose aussi d'une interface WYSIWYG. Dans la partie "File attachment with posts" tu indiques "No", mais pourtant on peut, mais seulement une image qui sera stockée dans un compte utilisateur personnel grâce au forum. Ensuite, d'une manière générale, dans les spécifications des forums, tu pourrais préciser si le forum noté accepte ou non l'insertion de fichier flash (vidéos, jeux, sons...). Voila, c'est tout ce que j'avais à écrire. I didn't see your french post, but the modifications you requested are performed.